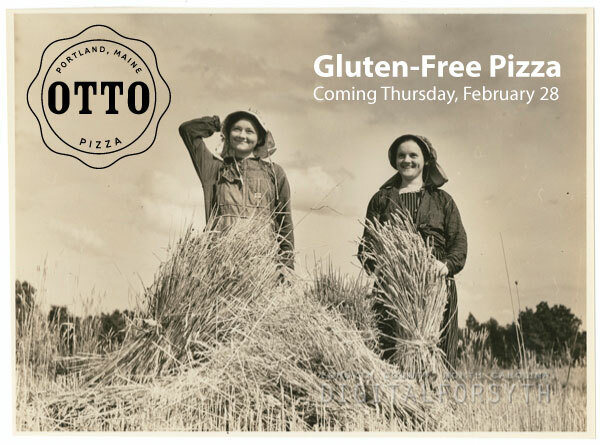 On Thursday, February 28, OTTO will begin providing a gluten-free crust option appropriate for guests with mild gluten sensitivities. Guests will also be able to wash their pizza down with a bottle of Estrella Damm, voted the World’s Best Gluten-Free Lager at the World Beer Awards. Thousands of Portland- and Boston-area gluten-sensitive eaters have been dying to try OTTO’s mashed potato, scallion, and bacon pie, or the butternut squash, ricotta, and cranberry option. Starting Feb. 28, they can dig in. Every pizza on OTTO’s menu, with the exception of the three-cheese tortellini (which is gluten-based) will be available on the new gluten-free crust. Gluten-free pizzas will be available as 10″ pies. OTTO’s gluten-free pizza is appropriate for guests with mild gluten sensitivity. However, it is not recommended to guests with celiac disease. While the crust is prepared off-site in a 100% gluten-free production facility, current store operations cannot guarantee that each hand-tossed pizza does not contain trace amounts of gluten. OTTO realizes that the launch of gluten-free pizza will not only be music to the ears of gluten-sensitive eaters throughout New England, but to their families and friends as well, as families and friends often limit their dining choices to restaurants that are appropriate for the whole party. OTTO looks forward to winning over a whole new wave of pizza aficionados. This entry was posted in gluten free and tagged Boston, Boston University, Brookline, cambridge, celiac, food, gluten, glutenfree, harvard, Maine, massachusetts, Pizza, Portland, wheat by elshepherd. Bookmark the permalink. exciting! can you let us know what kind of gluten free crust you are doing? brown rice flour? I read online somewhere you might be using spelt, but spelt isn’t gluten free…. thanks! Hi there, it is a rice flour-based crust. The crust is 100% gluten-free. THat is the bomb. thank you so much. I was able to eat Ottos for years until discovering gluten was making me sick. it is the thing I missed most on a gluten free diet. OTTOS pizza. Im going tomorrow!!! Awesome. But remember, we don’t start serving until Thursday Feb. 28. I am so very happy to hear this!!!! I commend Otto for attempting to cater to the gluten-free market, but I’d highly recommend you cater your offering of gluten-free options to those with the most severe gluten sensitivities (i.e. patrons with celiac disease). It is counterproductive and actually quite alienating to say you offer a gluten-free option which in fact you state is not 100% gluten-free, which is similar to the recent launch of gluten-free crust at Dominos and a backlash from the celiac community. Preventing cross-contamination is one of the most important aspects of offering a safe option to those with gluten issues, and I understand your reluctance to do so. However, please keep in mind that with education of staff and a few simple changes to kitchen practices, prevention can be done, and there are many other pizza restaurants that have done so successfully. A gluten-free lifestyle is not a fad for most people, and it is disheartening to hear that Otto is not taking the extra steps to ensure a contamination-free experience for those of us who need it most. Thank you for your feedback. While OTTO hopes to one day provide a gluten-free pizza that we can recommend to those with celiac disease, our current facilities cannot guarantee that traces of flour will not come into contact with the gluten-free pies. Our locations are currently very tight spaces, and although we are taking great care to avoid cross-contamination when topping our gluten-free crust (including using dedicated utensils, gloves, trays, etc. ), there are traces of flour that are airborne in our hand-tossed pizza environment that could come in contact with the pizza during preparation. Due to this fact, we are not recommending it for those with severe reactions to trace amounts of gluten. We will continue to explore ways in which we can guarantee that pizzas created with our gluten-free dough are appropriate for those with celiac disease, but until that is possible, we are pleased to offer a product that can be enjoyed by our guests with less severe gluten sensitivities. We care a great deal about our guests, and it is our goal to make our pizza available for as many people as possible. While we wish we could recommend the gluten-free option to those with celiac disease, we feel that this is a step in that direction, and that in time, we will be able to do so.